from handpicked, kiln dried blanks. alignment, intensity of the figure and its uniformity, as well as how unique it may be. premium grade each subdivides into 3 or 4 different levels. availability of our other species such as purple heart, cocobolo, bucote, English walnut, wenge. Discounts are available for 1 dozen, and 100+ pieces. We offer turned walking cane blanks and knife handle material for custom knives. Do you make your Tomahawk Handles from split wood? Can you make modifications to your pattern? No. However, if your order is for 50 pieces or more, we can reproduce your own pattern. How long does it take to produce an order of 50 or more handles? prohibited and nature does not produce enough. Can I request a specific wood to be made into a handle? Yes, but it takes time. What species have you used so far to make Tomahawk Handles? 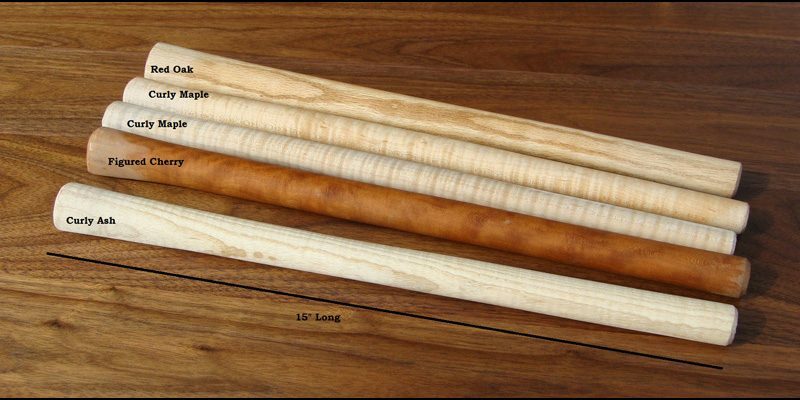 chestnut, osage orange, curly red and white oak; figured English and American walnut. availability of other species if desired.